In February 2010, the Affiliated Network for Social Accountability in East Asia and the Pacific (ANSA-EAP) and Oxfam Great Britain in East Asia (OGB) organized a roundtable discussion on the social accountability dimensions of gender equality and sustainable livelihoods. 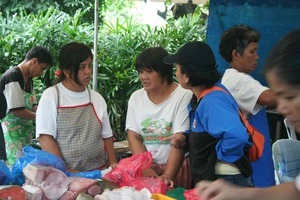 The roundtable was part of the runoff to a Forum on Gender and Livelihoods that OGB held in Bangkok. This discussion paper was prepared for the roundtable. SOCIAL ACCOUNTABILITY IS a process of constructive engagement between citizens and government, in order to hold government answerable for its decision and actions. Through this, citizens are connected to the government, thereby giving them a concrete handle for sustaining meaningful participation in meeting their most immediate needs. It contributes to advancing people’s welfare and security. Two forces drive social accountability: informed citizen groups who are direct beneficiaries of public services and government, which provides the space for citizen participation in governance such as monitoring public programs. Its approach is premised upon the following: that government keeps the door open for people’s participation and that citizens are willing to engage the government. Certain enabling conditions must be in place in order for social accountability to happen. These enabling conditions, known as the Four Pillars of Social Accountability, are: organized and capable citizen groups; an enabling environment with government champions who are willing to engage; context and cultural appropriateness; and access to information. In the context of social accountability, an enabling environment refers to the set of eco-political and socio-cultural conditions as interrelated factors that define the space for constructive engagement and good governance. How could women communicate their needs and have government account to them? How do internal management systems, performance measures, incentives and accountability systems promote responsiveness to women clients? How would they make these systems and measure respond to their needs? How could women negotiate the space where constructive dialogue is made possible? Who would equip them with the knowledge on making governments account to them, such as the public finance, gender-responsive budgeting and tracking expenditures? Social accountability mechanisms improve governance at the local and national levels, especially where corruption is pervasive and prevents development. A voiced relationship should be fostered between the women-client and the policy maker so that a running dialogue would strengthen women’s claims to services that are due them. The government could also benefit from feedback on its service delivery mechanisms. This premise is important if the promotion of women’s economic development and leadership were to be undertaken to reduce rural poverty, which disproportionately affects women. OGB promotes a Poor Women’s Economic Leadership (PWEL) framework. PWEL focuses on enabling poor women to effectively participate in and meaningfully contribute to economic decision-making and to gain control over economic resource on equal footing with men at the household, community, national and global levels. Linking social accountability to OGB’s PWEL Framework—a multidimensional lens inclusive of social accountability, gender and good governance—would pave the way for women to have a sustained relationship with not only government, but also other stakeholders with a developed mechanism for monitoring towards achieving economic leadership and development. Contextually, the absence of government engagement would be more effective in a laissez-faire economy where government interference in private economic decisions such as pricing, production and distribution of goods and services makes for a better economy. Given that most of the countries in the East Asia and the Pacific do not adhere to this system -- especially in East Asia and the Pacific where there are more strong states than weak ones, the absence of government in the equation of women’s economic development and leadership is not possible. Secondly, from a human rights perspective, it may be a bit too simplistic to assume or conjecture that securing economic resources and accessing and gaining the benefits of markets while changing attitudes and beliefs so that equal relations with men will be achieved, especially in economic decision-making at the individual, household, community and beyond would work in a way that protects the welfare and agency of the woman. Especially amongst the rural poor where violence against women is more prevalent, there has to be an enforcement mechanism that women could use should their rights be violated. Of course, these enforcement mechanisms are imperfect (and most women do not report), but at least the awareness exists that it is there and in place as legislation. In Naga City, in the Bicol Region of the Philippines, a collective of women hired a social worker to visit each family for the purpose of loan and/or collection. The social worker found many women battered women in these homes. The collective leader went to the Mayor to report the prevalence of domestic violence in these homes. In the Town of Capoocan, Leyte Province, the Philippines, the local government carried out a program called PRO-GAD Capoocan. This program successfully implemented participatory and gender-responsive governance. Its biggest accomplishment has been to reduce violence against women and children as the result of an intensive campaign. It is difficult to turn everyone into entrepreneurs. There are those who have to mediate and prioritize competing needs that their situation dictates. While there are people who just want a decent living with wages, etc., there is a select group of people who are apt to be more dominant and, therefore, influential than the rest. For example, in the level of subsistence, very few women are able to successfully transition from small to medium to big enterprise. It is also crucial for entrepreneurs to know and understand their mission and work for society. Entrepreneurship should be seen as public service, i.e. creating jobs for workers and not going beyond a profit margin solely for the sake of making a profit. Economic leadership involves asking what kind of profit one is generating. The multidimensional approach—one where all the lenses and perspectives are used, would probe into what kind of economic leadership is one going to practice. The important element of leadership is knowing one’s purpose: to not only make profit for one’s self but also know where that profit is going. How are women transformed into leaders? Leadership is not lodged on one person. It is a relationship between different roles and competencies. The OGB framework will not work if leadership is seen only for a few select individuals. Drawing up competencies, clearly delineating roles and having these different roles and competencies talk to each other is also one crucial aspect mentioned, especially as it relates to the OGB framework. Group efficiency necessitates matching people’s capacities with the roles appropriate for them. Mobilizing a group or gaining confidence in setting a platform for collective action necessitates this delineation of functions and competencies. Those can teach cannot necessarily audit. Those who cannot audit may not necessarily be skilled in mobilizing. But how would one translate it into a practical tool on the ground when a few select women attend technical training and capacity building workshops? The bigger issue is how to put different people with different competencies and background together and get them to work efficiently and effectively. Another issue that came to the fore is highlighting the value in finding out where the communities of leaders are. Where is the leadership that is most palpable whether it be in the policy, environment or market/enterprise arena? OGB needs to come up with tools for analytics and capacity building. But then the issue arises on how to de-link those tools with the desired outcome of economic leadership. The first step is context. Within that context, OGB needs to profile a majority of women. If the focus is geographic or community, it has to contend with differentiated responses. Find out what is “dominant” so that there is coherence in intervention. If it is looking at a larger area, say in the provincial level, then OGB can decide whether it is more rights based. The ability to select those who have more needs is present within that context because OGB will not be driven by the needs of the community. From its platform, it can choose whom to service. Overall, there needs to be a clear layout on how women can transform from a minor player in the market to an economic leadership position. Importantly, once they have become leaders, what are the practices that would sustain their roles? A multilevel analysis of women from self (the woman as having something of her own other than her children and husband), to family (how to involve them in becoming gender aware), to community (how to get families involved in discussions and dialogue) to the national level (becoming a part of a national movement) sets a enabling environment for women to realize their own agency, to own and direct their resources and to place a cost and value structure to their work. In the context of gender and sustainable livelihoods, the capacity of women is a key factor in the successful application of social accountability. The power of women’s groups is hinged upon the knowledge and capacity to organize themselves, their partners from other sectors and communities, as well as engage other development stakeholders and government. This capacity has technical and substantive components, as well as procedural requirement, so that efficient and effective initiatives in the form of agenda, platforms, projects and programs bring the outcomes and changes aspired for. Organizing and awareness-raising are central to social accountability and to gender. Training and education leads to increased decision-making power in the household and community. To address the gap between technical knowledge on subsistence and transition from small to medium to big enterprise, training could be undertaken so that women will not only develop a sense of clarity and confidence in their abilities, but also possess the ability to organize the group as strong economic leaders. Capacity building is necessary in providing a space in which women can negotiate a dialogue with government, i.e. about gender budgeting. Central to accountability and engagement is information; this is where the tools should be drawn and derived from. A critical approach would be public finance and gender-budgeting as an entryway into generating a constructive and productive relationship with the government. Questions of participation (Did you participate? ), policy (Is there policy? ), budget (Is there budget) and tracking expenditure (Is the budget expended according to budget or is there insertion of other expenses?) could be raised. The process of harmonizing planning, budget and expenditure is very important. In many local government units, the one doing the planning, the budgeting and expending are different people and, more often than not, there is something amiss when tracking expenditures. Third party monitoring is a major entry point in getting women to participate in governance. ANSA-EAP, for example, focuses on procurement monitoring. Given the fact that many corrupt practices stem from misuse of funds, the social accountability approach advocates for precautionary and sustainable governance practices. As a third-party monitor, the women could link procurement back to the scorecard: Did the government agency perform? Did they deliver? Where are the key government leaders who are accountable? To reiterate, leadership is not embodied solely by one individual, but by a group. The skills of dialogue and negotiation are skills of influencing. This is the core of leadership practice: How to influence? How to change? How to be a proponent of change? These are the key leadership elements. The two drivers for change for a social accountability set up are a responsive government and organized capable citizens. Together, they should know what their roles/functions are and to what extent they will engage each other. Social accountability is a very important element in the women economic leadership discussion. Bringing the analytics of governance in the OGB framework would expand its approach beyond the market. The core of social accountability is to know and have the capacity to engage other stakeholders. Given this, engaging governments is very critical in the OGB framework. Government is and remains a valuable resource because it sets economic policies and channels the budget for resources. Importantly, the government is accountable to women for efficient service delivery and procurement. If it can engage government, it can engage businesses, as well. There has to be a proactive and healthy relationship between the private sector and the government so that there is a free dialogue between the two. Sometimes, there is a disconnect in their relationship and the effect is apparent in the local governments lack of policy targeting training with the market/employment needs of a city. The usefulness of government in this situation is the trust that is built between the local population and the government. In Naga City, the local government came to a point where they got the trust of the private sector and citizens to tell them what they need in terms of training and employment so that training would be targeted to the intended occupation afterwards. A less than optimal relationship would be inefficient. For example, the local government or TESDA could you just give the women arbitrary training in any field, instead of considering the needs of that particular area in terms of market and employment. Women and government can work successfully together as demonstrated in the case of Naga City and the Naga City Council of Women where a lot of work was done in improving women’s livelihoods through proactive and intervention. Social accountability must respond to the context of where it is operating, whether it be a sector, nation or region. The tools and techniques and other mechanisms of social accountability are determined against political, socio-cultural, legal and institutional factors. For example, the likelihood of success of certain social accountability initiatives are dependent on political context –whether the political regime is democratic or authoritarian, whether basic political and civil rights are guaranteed and whether there is a culture of political transparency. The areas of change, as stipulated in the PWEL framework, are attitudes and beliefs, flexible structures, law and policy, roles and responsibilities. They inform one another and are interrelated. After all, more often than not, law and policy stem from attitudes and beliefs of the policy makers and cannot be discussed in isolation. The cultural context needs to be figured in. Lastly, gender is an analytical tool to understand social processes and its attributes vary from society to society and change over time. Hence, the cultural appropriateness of intervention matters. Sometimes, culture is stronger than the law. Perhaps, in some countries, culture is in the law. In all these, attitudes and beliefs matter. The criteria for examining what will work for women and improving upon their current work are context-driven and country/culture-dependent. The availability and reliability of public documents and data are essential to social accountability. Data turned into relevant and useful information is the basis for constructive engagement. Thus the quality of information and its accessibility are key factors for the success of social accountability mechanisms. Processed information is a very important component in running dialogues between women and government. If one cannot act on the information they have, the tendency is to resort to anger, which is counterproductive. If the protest mode is resorted to, the knowledge to effectively engage government is lost and, because of this, the opportunity for constructive change is, too. If one does not have the mechanism for engagement, one cannot use the information available to him/her. There is no meaning in powerlessness. Negotiation cannot be realized without constructive engagement. Importantly, economic leadership is not possible without informed choices. Research on case studies and best practices where the intervention marrying gender, governance and social accountability were successful. Research on how muscle monitoring could be strengthened amongst citizens/women’s groups. Efficiency in framework implementation and ground work is dependent upon using analytics that embed gender. This is how the sensitization of stakeholders happens, particularly the government. The government is a major stakeholder because it sets policies and sanctions businesses and can give one access to resources. A gender analysis of the production system is recommended because it underscores the invisibility of women in market analysis. Engage government in delivery of services and rights protection for the promotion of welfare. Citizens have a right to information, association, expression and participation. People should feel protected and have sense of security. Women should be taught the logic and practice of planning, budgeting, expenditure, procurement and monitoring. This is a powerful skill for women to have, especially in engaging government into a constructive dialogue. OGB should have a strategy in every step of its execution. This is where prioritization of engaging stakeholders should be undertaken. Link household analysis with market analysis and embed competency in accountability. Training techniques should be less on lecture and theory and more on practicality. Use graded language and activities that are simple, such as role playing. The framework is not for ordinary women leaders. Create a pool of talents who will have the capacity to implement the framework in varied roles and competencies. Come up with toolkits that are synthesized, user-friendly and not too scholarly. They have to “speak” to the women. Map and create competencies for OGB staff, talent pool and women and have them interrogated and validated through dialogue. Gender is very personal. Establish a connection between the economic, analytics and the personal. Economic leadership is a good objective but certain issues need to be addressed both on the theoretical and practical level for OGB to realize its full use and potential. OGB’s strategy on gender and sustainable livelihoods and its framework could be augmented using the social accountability approach. The social accountability lens would provide both OGB and the women a practical approach in which to reduce rural poverty and advance the economic empowerment and leadership of women. Arroyo, D. & Sirker, K. 2005. Stocktaking of Social Accountability Initiatives in the Asia and Pacific Region. The International Bank for Reconstruction and Development/The World Bank. Washington, DC, USA. Asian Development Bank [ADB]. 2006. Implementation Review of the Policy on Gender and Development. Manila, Philippines. ADB. 2008. Paradox and Promise in the Philippines: A Joint Country Gender Assessment, Manila Philippines. Barrameda Villamor, T. 2007. Problematizing Gender in FSSI’s Economic Enterprises: A Discussion Paper. Foundation for a Sustainable Society, Inc., Philippines. Campos, E.J. & Pradhan, S. 2004. Informal Note on Governance for the World Bank PREM Governance Group: A Framework for Studying Governance Reforms at the Country Level. The World Bank, Washington, DC, USA. Jacob, J. 2000. "Empowering the Local Government: The Naga City Experience." Asian Review of Public Administration, Vol. XII, No. 1, January-June 2000. Javate de Dios, A. 2008. From Budgets to Representation (Draft). UNIFEM and UN-GMC Input to the Country Gender Assessment with other Donors. King, R. & Sweetman, C. 2010. A Discussion Paper: Gender Perspectives on the Global Economic Crisis. Oxfam Great Britain, U.K.
Zuckerman, E. 2002. Evaluation of Gender Mainstreaming in Advocacy Work on Poverty Reduction Strategy Papers (PRSPs): Synthesis Report. Oxfam Great Britain. The author has a Master of International Affairs from Columbia University.